Campanile Hotel01924 201054work Budget HotelThe Campanile Hotel is located on Monkton Business Park, which is just a short distance from the centre of Wakefield. All rooms are en-suite with towels changed daily and come equipped with Flat screen T.V.s offering a range of freeview channels, tea and coffee making facilities, direct dial telephone, wi-fi (with supplement), wake up call service, local information guide, hairdryer, independently controlled heating and black-out shutters. Meeting rooms are also available, please phone for more details. 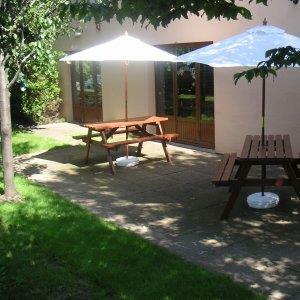 The Campanile Hotel is located on Monkton Business Park, which is just a short distance from the centre of Wakefield. Attractions located close by include, Pugneys Country Park, Sandal Castle and Thornes Park plus the wealth of Yorkshire's finest tourist destinations are easily accessed from the Campanile Hotel. Leave the city centre on the A636 (Denby Dale Road). Monkton Industrial Estate is located on right just passed railway bridge and traffic signals. Hotel is at the end of the road. Leave the M1 at jct39. Follow signs for Wakefield City Centre (A636). Monkton Industrial Estate is located on the left.